Featured News Can biodiversity conservation lead to more chocolate? Can biodiversity conservation lead to more chocolate? Researchers at James Cook University are looking at how native animals might increase cocoa production and reduce insecticide use in tropical forests near Daintree National Park. 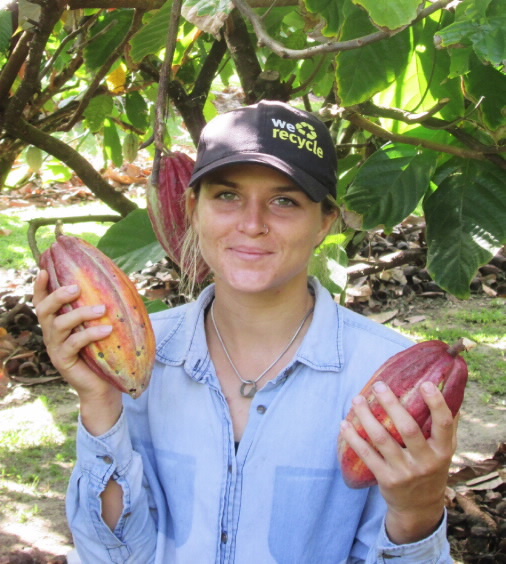 JCU graduate student Samantha Forbes and Dr Tobin Northfield from the Centre for Tropical Biodiversity and Climate Change are working with cocoa farmers from Daintree Estates Chocolate, investigating how sustainable farming practices can encourage pollination and natural pest control. The transformation from cocoa flowers to fruit pods containing the essential cocoa beans relies on small midges that develop in decomposing organic matter, such as fallen cocoa fruits. However, on a working farm, the fruits are harvested and removed, limiting the amount of habitat available for the midges to grow. The use of insecticides can also harm the midges, so Ms Forbes and Dr Northfield are investigating how native insect predators, including green ants, spiders and skinks, can control pests in the cocoa farms. Ms Forbes, a MSc student, initiated the project after discussions with Dr Barry Kitchen, Executive Chairman of Daintree Estates Australian Chocolate. The project represents an important link between science and agriculture, and Samantha has been the liaison throughout. One of the methods under investigation is to provide fruit husks left over from production as habitat for the midges. An added bonus is the husks may also then provide habitat for native insect and skink species.